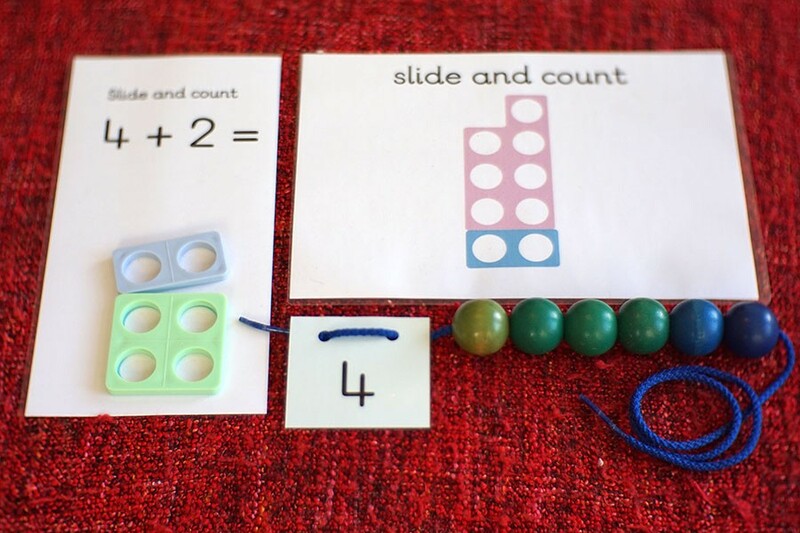 Once children have mastered ‘count count count’, they may be ready for the adding strategy ‘slide and count’. This is the first step moving away from merely counting to add and towards using an understanding of how numbers fit together. Using the active resources, children set out the sum, e.g. 4+2. As they know how many are in the first set, they don’t have to recount this number. Instead they slide their finger over, saying ‘4’ and then count on for the rest of the beads, ‘5,6’. This strategy is faster, more accurate as there is less to count and is the basis for working with larger numbers. However, if children do not understand what they are doing and why they don’t have to recount the first addend, then I would not encourage them to use it. If children are familiar with numicon, this is a great resource to use with this strategy. Otherwise, sets of coloured number towers are equally effective.